Tag line: "She climbed the ladder of success - wrong by wrong!" One of the most infamous films of the Pre-Code era, 1933’s Baby Face features scenes of sexuality so alarming that censors in New York demanded a large number of cuts before it could be shown in that state. Relating the tale of a young girl who sleeps her way to society’s top tier, Baby Face stars Barbara Stanwyck as Lily Powers, and as the movie begins she’s living in Erie, Pennsylvania with her bootlegging father, Nick (Robert Barrat). To ensure the cops don’t shut down his speakeasy (the story is set during prohibition), Nick “loans” Lily out from time to time to local politicians. When dear old dad is killed in an explosion (caused by a malfunctioning still), Lily takes the advice of the elderly Mr. Cragg (Alphonse Ethier) and travels to the big citym where she will “Use men” to get the things she wants. With her best friend / maid, Chico (Theresa Harris), in tow, Lily arrives in New York, and within a day lands a low-paying position at the city’s most prestigious financial insitution. Not content with staying at the bottom of the corporate ladder, Lily seduces several executives, including Mr. Brody (Douglass Dumbrille), a married father of two; and Ned Stevens (Donald Cook), who is engaged to the daughter of the Bank’s president, J.P. Carter (Henry Kolker). Even old man Carter eventually succumbs to her charms, resulting in a love triangle that ends in disaster when Stevens, saying he can’t live without her, shows up at Lily’s apartment with a gun. 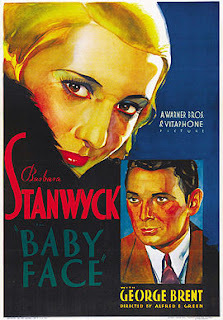 Baby Face is, indeed, frank in its portrayal of its lead character’s promiscuity, though the movie is also quick to reveal her “condition” isn’t entirely her fault. When rebuked by her father for not sleeping with local politician Ed Sipple (Arthur Hohl), who could shut down their speakeasy with a phone call, Lily angrily blurts out “A swell start you gave me. Ever since I was fourteen, what's it been? Nothing but men! Dirty rotten men!”. Clearly, she’d been exploited from an early age, so when Cragg - quoting Nietzsche - advises her to use her body to get what she wants out of life, Lily is oinly too happy to follow his suggestion to the letter. Her first “encounter” occurs while she and Chico, without a dime between them, are hiding out in a freight car that's heading to New York City. Before the train pulls away, they’re discovered by a railroad worker (James Murray), who attempts to throw them off. It’s at this point that Lily applies her feminine charm, sleeping with the worker in exchange for a free ride. She will use this same "power" to eventually seduce her superiors at the bank as well (including Jimmy McCoy, played by a young John Wayne), and the most interesting aspect of Baby Face is that it never condemns Lily’s actions outright, spewing its venom instead at her conquests, almost all of whom are portrayed as lecherous, weak, or a combination of the two. This wouldn’t be the last time Barbara Stanwyck played a screen temptress; in Billy Wilder’s Double Indemnity, she seduces mild-mannered insurance salesman Fred MacMurray, then convinces him to kill her husband. Yet as alluring as she was in Wilder's classic, her character in that movie isn’t as manipulative as Lily Powers is in Baby Face. After five minutes of watching this film, you’ll be amazed how sexually candid it is. I have no problem believing this film shocked audiences in 1933, because, to be honest, it kinda shocked me, too! I must agree. First time I saw this film I was amazed that it was produced in the early 1930s.